World's First Electric Camera Shutter! This simple box camera had an electrically operated shutter in 1939! The Electricamera solved the problem of flash synchronization in an unusual but elegant way: the shutter was operated by a solenoid which was wired through the flash bulb! Current through the bulb opened the shutter as the bulb began to fire; when the bulb blew out, the shutter closed. The resulting shutter speed varied from about 1/40 to 1/100 second, depending on bulb type, karma and phase of the moon... but flash synchronization was always perfect. For daylight photos, a conventional mechanical release was provided on the right hand side of the camera. The Press-Flash, with conventional mechanical flash synch, and the electricamera were both made by Falcon (Utility Mfg. Co.) in 1939, thus sharing the honors as the first cameras ever made with a built-in flash gun. 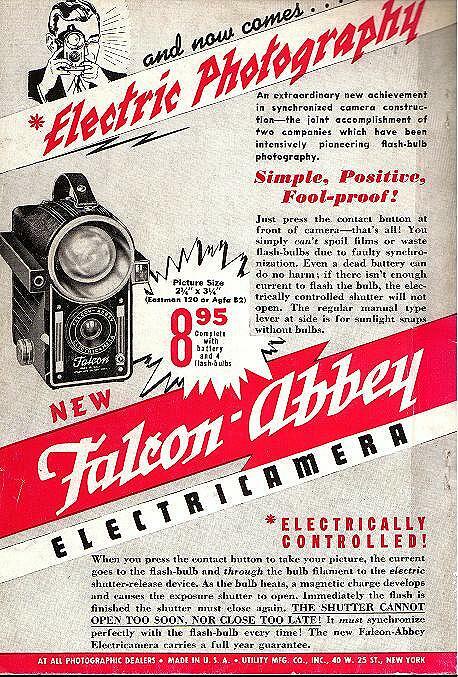 The Electricamera was 50% more expensive than the Press-Flash at $9.